The ban applies to a 15-km zone on each side. 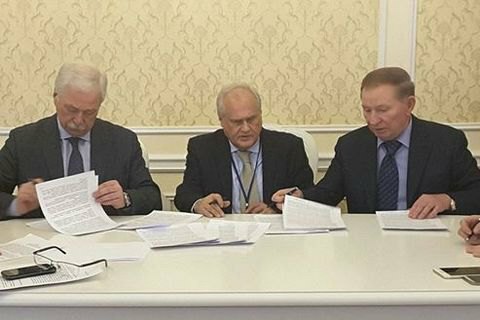 The trilateral contact group on a Donbas settlement, which met in Minsk today, signed an agreement banning shooting practice along the line of contact in Donbas, effective as of 4 March. "This means any training involving combat shooting along the 30-km zone along the line of contact is prohibited. Representatives of certain areas of Donetsk and Luhansk regions together with representatives of the Russian Armed Forces hold such exercises on a regular basis. Shooting in the course of these exercise is of provocative character and can prompt a backlash the same way as salvos during combat engagements do. Besides, the OSCE Special Monitoring Mission registers all the shots along the line of contact," Darya Olifer, the press secretary of Ukraine's representative at the talks and former president, Leonid Kuchma, said on Facebook. Ukraine holds no shooting practice in this area at all. The sides also signed an agreement on the technical aspects of mine clearance in 12 agreed sectors along the line of contact, she added. The documents were signed by Leonid Kuchma, the OSCE's Martin Sajdik and Russia's Boris Gryzlov. They are to be endorsed by Oleksandr Zakharchenko and Ihor Plotnytskyy, the chieftains of Donetsk and Luhansk separatists respectively. Ukrainian pilot jailed in Russia says "not up for trading"